Making ends meet these days is increasingly difficult for lots of people—especially if you’re working class parents with too many bills to pay and a small paycheck. There are lots of people who simply refuse to believe that some people have to choose between things like getting enough for their families to eat and necessities like car seats, but it’s increasingly common. 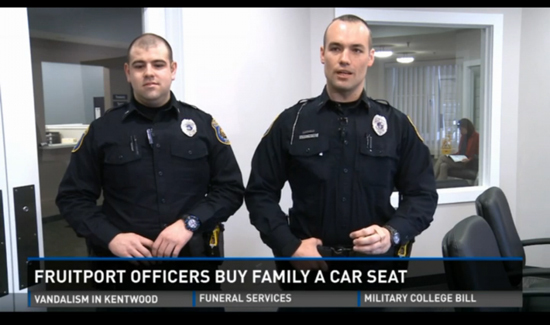 When a fast-food worker called police in Michigan recently after he observed an infant that was not in a car seat, two Fruitport Township officers responded. The cops would have been entirely justified in writing a citation and moving on to the next call. But Officers James Hodges and Jason Pavlige went the extra mile. One of them stayed with the family while the other went to Wal-Mart with the money they put together and bought the family a car seat. Here’s the best part—the officers didn’t even bother to blow their own horns. They just saw something that needed doing and did it. The only reason the heartwarming tale came to light was that a Wal-Mart employee, who was blown away by the cops’ act of kindness, called the local news to tell the story.